Having picture books available for young children to look at and listen to is almost as important as having air to breathe and food to eat. Set up a bookshelf for your child’s collection. Books can be expensive…check out used book stores and consignment shops for discounted picture books. The library is an amazing resource for children’s books. You can speak to the librarian about recommendations and story programs. This last reminder reminds me that we need to announce the WINNER of the March Positive Parental Participation Reading Challenge. Marcy, over at Orples, is a hands-on grandmother. We’ve connected through Jake’s Sunday Posts and she often writes about the activities she and her grandchildren do together. I know she will enjoy sharing a new picture book with them. Congratulations, Marcy! 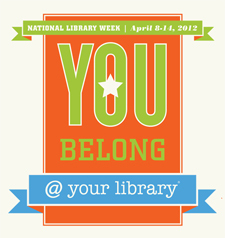 National Library Week is April 8-14. To help celebrate, visit the library with your children at least one day next week if you can…and make it a habit to go often. Does your child have a library card yet? Find out how old your child has to be…if he doesn’t have one yet and is old enough, help celebrate National Library Week by signing him up. A child’s library card is a passport for learning about the world. 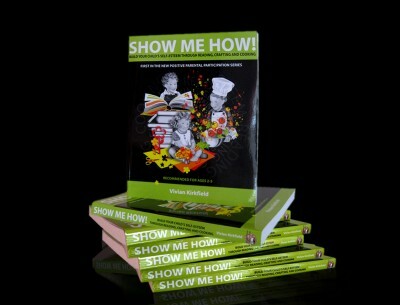 Do you want your library to win one of the 25 copies of Show Me How! Build Your Child’s Self-Esteem Through Reading, Crafting and Cooking (MoneyPenny Press, Ltd. 2010)? Many libraries are very limited in what new materials they can buy for their collections because of reduced revenues. Another way to celebrate National Library Week is to nominate your library to win a copy of this great parent/child activity book? It’s easy! If you haven’t done it already, just leave a comment on this post, naming the library and telling why the people in your community would benefit from having the book available to them. At the end of the month, twenty-five libraries will be chosen through Random.org and the people who did the nominating will get to present the book to their local library. Do you tweet on Twitter? Are you a fan of Facebook? Have you pinned anything on Pinterest yet? Please help me spread the word by tweeting, posting and/or pinning about the Show-Me-How Library Project. Thank you, thank you, thank you…and now…are you still there…here is a really special picture book, just in time for Easter. Themes: Mastering tasks and skills, goal-setting, holidays (Easter), overcoming gender discrimination, family, working together. A young country bunny sets a goal for herself of becoming one of the five Easter bunnies who deliver Easter eggs all over the world. It seems her dreams will not be realized as the little bunny grows up and becomes the mother of twenty-one baby bunnies. Using ingenuity, common sense and lots of determination, she trains each of her children to master certain skills. Will Little Cottontail Mother prove that she is the kindest, wisest and fastest bunny in the whole world? Can she complete all of her tasks? Does she win the golden shoes that will enable her to fly? Read this charming story to find out! This book was written over seventy years ago…yes, you know how I love these old classic picture books…and is still relevant today! This is a very modern feminist tale…twenty-nine children and she still has a dream that she realizes…overcoming gender discrimination and economic hardships. I’ve made this craft with kindergarten classes…they really love it! This is a lovely keepsake because it is made from your child’s handprints. Hang on the refrigerator or use as an Easter door decoration. The picture here is from Artists Helping Children.org They have lots of great ideas and instructions on their website. 1. Trace at least 8 hands for each basket (these are the handle). 2. Cut out a basket shape and cut a slit in the top (the eggs will slip in here). 3. Lay out the handprints, overlapping slightly, to form a handle shape. Tape them while you are arranging them and then glue in place. 4. 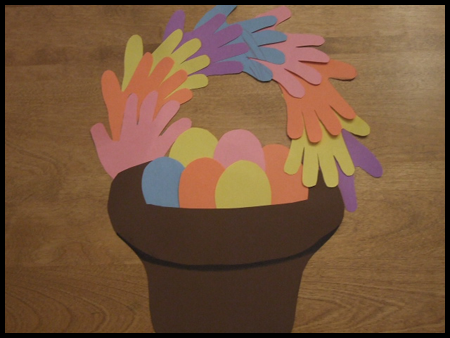 Cut out a bunch of Easter egg shapes. Your child can decorate them before sliding them into the slit. Glue in place when they are in the right place. Gail Terp has an awesome blog post with craft ideas and more here. Book Reviews for Kids did one here. Talk with your children about the tasks that Little Cottontail Mother taught her bunnies. What tasks can your child help with at home? This post is part of a series for parents and teachers called Perfect Picture Book Fridays hosted by Susanna Leonard Hill. Click on her link and find lots of other picture book suggestions with summaries and activities. And please, don’t forget to leave a comment, nominating your local library to be the recipient of a copy of Show Me How! This entry was posted in 2012 Positive Parental Participation Challenge, children's picture books, Crafting with Children, Easter activities, GIVEAWAYS, library cards, Perfect Picture Book Friday, Show-Me-How Library Project and tagged Facebook, Library, National Library Week, Pinterest, Susannah Leonard Hill, Twitter by viviankirkfield. Bookmark the permalink. I really like the activities you listed. I like how smart the mommy bunny sounds! The cover illustration is cute! What a nice Easter book. I’ve put your book on Pinterest, I hope it spreads the word. have a lovely Easter! A few months ago, a facebook friend shared this as one of her favorite childhood books. It sounds like a lovey story and I adore the illustration style of the 20’s and 30’s. My PPBF pick is a story that is over 70 years old, too. Oldies that have stood the test of generations! I love being introduced to old classics! It’s theme had to have been a little unusual 70 years ago! Is it still in print? Thanks for these wonderful activities. I know you can get copies on Amazon and other book sites. It really is amazing how forward thinking the author was back in 1939. I would more expect this after WWII, because women had stepped in for several years to replace men who were in the service…but I think the majority of women in 1939 were not in the workplace as they are now. Glad you liked the book, Joanna! What a wonderful book, Vivian. We just picked up a copy of the original Madeleine at the library’s used book sale. And we also enjoy Virginia Lee Burton’s books. It’s wonderful to see timeless tales we can still enjoy today. Thank for the reminder about National Library Week. I need to figure out a blog post about that. Glad I was able to give several people a heads-up about National Library Week. 🙂 I’ll look forward to reading you post! I wrote my post today, so it’s ready to go. And the only thing that saved me at the last sale was a 3-year-old having a temper tantrum. What a timely review and resources! Happy Easter! Thank you so much for stopping by, Miranda. I read this book many years ago (won’t say how many:) and have always loved it. Glad you liked it also! I remember this one as a child. Great books stand the test of time. Thank you for reminding of this charming tale. And, loved your activities. Great selection for the holiday. Thanks for the introduction to this classic! Gender discrimination and overcoming economic hardship from 70 YEARS AGO? Amazing! They are powerful messages we don’t expect to find in such a vintage picture book, aren’t they! Glad you liked it, Robyn! As others have already mentioned, your activities are always so good. And this book sounds excellent. Thank you! The PPBF is a wonderful outlet for my passion for picture books and crafting…maybe I should include the cooking element of the program in my next PPBF selection. Cooking is another activity that I love to do with young children to extend the learning experience. What a beautiful recommendation, Vivian. I’ve been looking for Easter-themed picture books and couldn’t find any that appealed to me. Thank you for sharing this one, which sounds amazing and ‘relevant’ as you put it with themes of overcoming one’s difficulties and resilience. I also love classic picture books that are out of print and stand the test of time. I am Pinning this in a new Board in Pinterest that I have just created for PPBF enthusiasts. Good luck on the Library Week as well, is this worldwide? Will inform our librarians here in Singapore about the event as well. Myra…I really appreciate you pinning this! I think the messages in this particular book are valuable for parents…just because you are a mom or a dad does not mean you must give up your dreams…families need to work together so each member can acheive their goals. Does anyone know of a less expensive way to ship a book overseas? Maybe there is a special category for shipping to libraries. We’ve read some excellent and funny books for Easter. I’ll have to give you the whole list at some point. Is this the page for April readings, or is there a different one? Wow…seventy years ago! I hope I can find this one because it sounds so cute! The activity is adorable and one of those keepsakes. Hi Penny…amazing, isn’t it…how forward thinking the author was? Vivian, I am still smiling at your lovely Mother’s Day card verse contest entry. I hope your “Sweet Caroline” knows how precious she is, and has always been. Especially now that she is a mother, too. The cycle is one of life’s greatest joys. Your entry was a beautiful example. Thank you so much, Marylin! Our relationship has always been close…we are kind of “on the same page” most of the time…I know I am so blessed…and I believe Caroline feels the same way. :) Glad you liked my little Mother’s Day card contest entry. 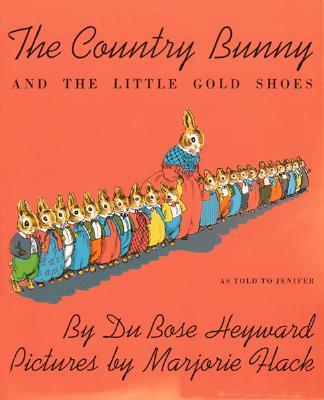 Is the Country Bunny book widely available online? I love the activities you add to go with it.